One of the best things that you can do for your pet, outside of getting a regular veterinary check-up, is to commit to vaccinations and preventives, such as heartworm treatment for dogs, at your local animal hospital in Dartmouth. When you work with a professional team of experts at your local veterinary clinic in Dartmouth, you get the peace of mind in knowing that you are doing everything in your power to give your pet a long, happy and healthy life. Vaccines can really help to prevent a number of common illnesses found in pets. Providing your pets with vaccinations is one of the easiest ways to protect them and help them to stay healthy. There are different types of vaccines for different types of diseases and illnesses, plus there are also different combinations of vaccines that can be given in one visit to help protect your pet even more thoroughly. In the simplest of terms, a vaccine is a procedure that is used to improve a pet’s lifestyle and health. However, like any other type of medical treatment, vaccines come with risks that must be weighed for the betterment of the pet in question. Your veterinarian at the local animal hospital in Dartmouth can work with you to create a schedule or regimen for vaccinations that will provide you with the most safe and effective care based upon your pet’s unique needs – and your budget. Vaccines work by helping to prepare your pet’s immune system to be able to fight off any disease-causing organisms that might infiltrate their body. A vaccine contains antigens which look similar to the organism that causes disease, but they do not actually cause disease. Once these antigens are introduced into the body through vaccination, the immune system becomes mildly stimulated, teaching the body how to fight off the disease. If exposure to the actual disease ever occurs, your pet’s immune system is trained and prepared in how to fight off the disease completely or to reduce the severity of the illness that can come as a result. What are the Most Common Vaccines? When it comes to pet ownership, there are a lot of different types available, based upon things like your pet’s risk of exposure, the severity of the disease and the ability of the disease to be transmitted to humans. Working with a qualified veterinarian can help you know when to give rabies shots and when heartworm treatment for dogs is most beneficial. Regular veterinary check-ups can also be used to determine whether additional non-core vaccines are required. 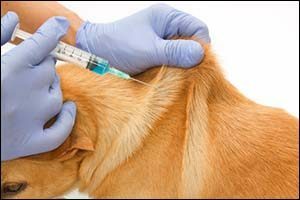 What are Other Vaccines Given for Pets? Depending on your dog’s age, lifestyle and exposure to disease, your veterinarian may recommend additional vaccines beyond the core or basic vaccines when you visit the veterinary clinic in Dartmouth. Your veterinary check-up does more than just check to see the current health of your pet, but is also used to determine the course of treatment and preventive action that will help your pet to stay healthy for many years to come. While there are local laws that require things like rabies to prevent the spread of this disease from wild animals to pets and then to people, your local veterinarian at Anchor Animal Hospital in Dartmouth can also help you know which vaccinations are best for your pet and the frequency required to ensure that these vaccinations are done properly. Your pet’s age, medical history, living environment, lifestyle, and the type of vaccine used, will all determine what is required and when. Visit Anchor Animal Hospital in Dartmouth for a regular veterinary check-up and to determine whether you need vaccinations for cats or heartworm treatment for dogs. Our team of highly trained veterinary specialists and technicians can help you to provide the very best in care for your family pet. Give us a call at 508-996-3731 to schedule an appointment or to learn more about our veterinary and preventive treatment programs.